Insert satisfied smile. I recently read Washington's Lady, my first read by Nany Moser (You can find the review for that book here at 5 Minutes for Moms.) and loved it. I promptly went out and bought the two other books in Moser's Ladies of History series, Just Jane and Mozart's Sister. 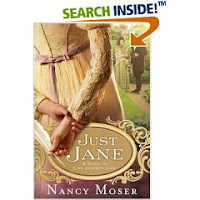 I wanted to read Just Jane first, in preparation for my re-reading of Austen's Pride & Prejudice in order that I might participate in the Classics Bookclub hosted by 5 Minutes for Books.) I was not disappointed. Just as in Washington's Lady, Moser weaves the fact and fiction of Austen's life into a delightful and informative story that makes you want to learn more about Austen's life. Once again I appreciated the way that Moser concludes her book by specifically laying out the areas of fact in the book and explaining why she took the liberties that she did with the rest. In some ways, I honestly find this more satisfying than a biographer who sometimes take their own liberties and proclaim them as truths leaving you wondering how much they can be relied upon to convey the person's actual story. I confess that I pretty much stopped reading this book the moment I got started, being hit by Austen's real or imaginary suitor, Tom Lefroy. I had to made sure that this book wasn't the involved in the movie Becoming Jane (to make sure I wasn't going to suffer a silly and imaginative love story). After discovering that I was safe from association with Anne Hathaway and her portrayal of Austen, I continued on. (I watched Becoming Jane earlier this year and wasn't remotely impressed.) I think Moser does a great job with the subject matter of Jane's early "suitor" (IF he can be called that). The fact is, no one really knows what relationship, if any, occurred between Lefroy and Jane. It's merely speculation and reader's fancy. Or, in some cases, Hollywood's fancy. It's true he existed, that there seemed to be a meeting and some time spent together but that is, from all I can gather, the extent of the situation. However, she must have thought of him . . . ? I don't know enough to say. She did not marry Lefroy and, given the times in which she lived, I think it is preposterous to assume that she would pulled a Marianne (Sense and Sensibility), throw caution to the wind and expose her heart to such a degree in public. I think it would have been beyond her personality to do that sort of thing. I was glad that Moser pretty much wrote Lefroy out of the picture and moved on. All in all I'm just really happy with Moser's writing. I don't want to claim that it's an "educational read" but, truly, in some ways - it is! It captures your imagination for times and persons who are historically important even in modern society. She just does a great job making her characters come alive. I (still) heartily recommend her to anyone who has not yet had the pleasure of making their acquaintance with Moser. (Can you tell what I've been reading or what?) If you haven't gotten around to reading anything by her, don't put it off for too much longer! It's just plain fun. I actually got a kick out of Becoming Jane, in a perverse sort of way. I knew myself that Austen never married, but apparently my roommate (who I watched it with) didn't. When it ends with her still unmarried (which is rather un-Austenlike, thus the confusion for my roommate), it really bugged her. Whooops. Thanks for reviewing this. Alison's S. currently reading this very book and so far she said she really liked it. I'll have to add Moser's books to my reading list. I'm very curious to hear what you think of Mozart's Sister being less well-known than the other two. Btw, did you see the PBS Jane Austen bio movie that came out earlier this spring? It takes place when she is older. I'm curious to hear your thoughts on that film adaptation of her life. Thanks for sharing your opinion! I just finished this book late last night and enjoyed it very much. It took me a little bit to get into it. That is probably because I have several books going right now. I did eventually get hooked and plowed through the last 170+ pages last night. I think Washington's Lady is next for me, but I'm looking forward to Mozart's Sister as well. Did you know she is working on a book "How Do I Love Thee?" about Elizabeth Barrett Browning (due out in summer of 2009)? Time to add another book to the "to read" list! After reading your review at 5M4B, I picked up this book (I don't have Washington's Lady yet, but I plan to). I finished it today, and I enjoyed it as well. I also appreciated the section at the end where she included the facts. In all honesty, if I hadn't read Austen's books, I probably wouldn't have enjoyed the book as much as I did, but I really enjoyed the perspective I gained from it. I think I will enjoy rereading the books even more now that I have a greater appreciation for her life. I didn't care for Becoming Jane because it was pretty focused on her relationship with Lefroy. What Might Have Happened But Probably Absolutely Did Not is the highlight of the film. Good kisses, heart break hotel, etc., etc. Too passionate where there is no evidence of it. Hence, I did not care for it. But if it were a chick flick based on an imaginary character I might have. If I think of it that way, maybe I CAN like it. I am glad you liked this one too! I still haven't read either of the other two, but I will. . .